Member Meetings: Meetings are usually held the third Monday of each month at 7:00 p.m. at the Rockville United Methodist Church, 142 Grove Street, Vernon. Guests are welcome at no charge. To stimulate an interest in horticulture, aid in the protection of native trees, birds, wildflowers and promote community spirit, beautification and civic betterment. Members also participate in many community environmental activities and plant and wildlife endeavors. The club has very active Master Gardeners, birders, hikers and conservationists. When friends JEAN MERZ and GINNY GINGRAS made plans for their retirement from teaching, their first priority was to start a local garden club. 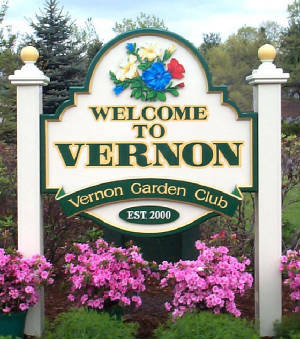 Less than 6 months later, on April 27, 2000, the initial meeting of the Vernon Garden Club (VGC) was held. Eighteen enthusiastic gardeners, recruited largely through word of mouth, attended that organizational meeting and became charter members. In October 2000, the club became a member of the Federated Garden Clubs of Connecticut. The Club has been involved in planting a number of gardens in the Tankerhoosen Valley. They continue to maintain several of them. Garden On The Green: Located at the intersection of Routes 30 and 83 at 'Vernon Circle' this garden welcomes visitors entering Vernon from the East. The club provides on-going maintenance for this garden also. These plants are also mostly drought tolerant perennials. The second anniversary of the Garden Club was held in April 2002 with this unveiling of their first community garden. After a year of discussions, planning, and community fund raising for the garden their vision came to fruition. 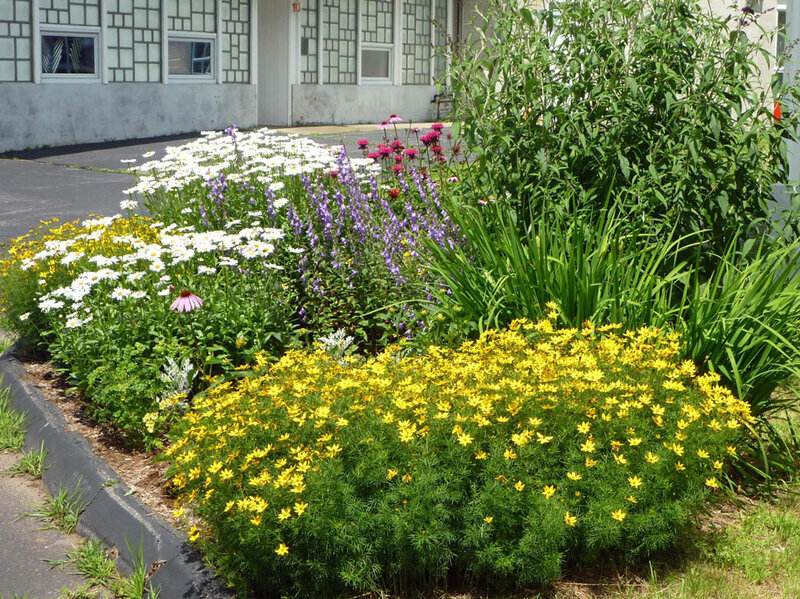 A large shabby area was transformed into a colorful 4-season perennial garden. The garden serves as a welcoming gateway to town. Maintaining the project has truly been a shared endeavor. Club members regularly schedule time to weed, deadhead, compost, fertilize and prune. Initially, the town's volunteer fire department watered the site, which lacks a water source. The plants are mostly drought tolerant perennials because there are labor intensive watering problems. 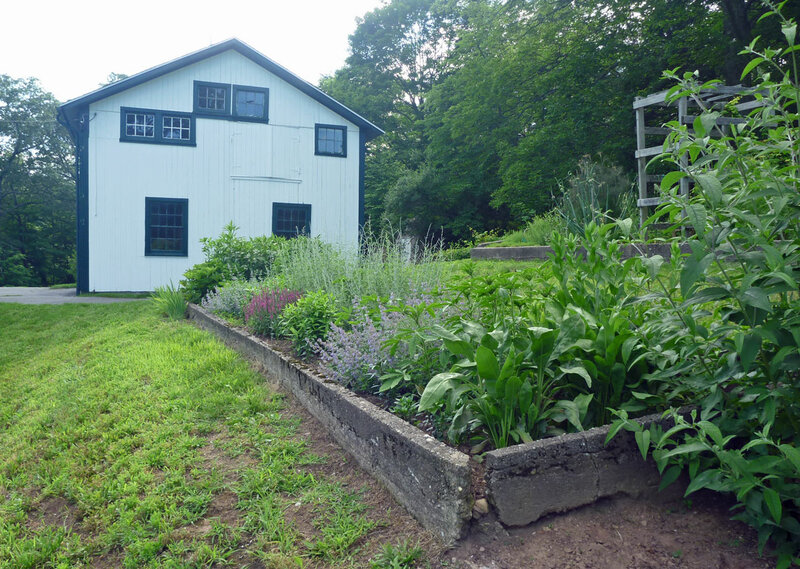 Valley Falls Herb Garden: Within weeks of opening the gateway garden in 2002, the VGC's novice Herb Garden group christened their new kitchen herb garden located at the town's historic Valley Falls Farm, a local landmark. Lacking funds to create a new garden space, members creatively rehabilitated a large, long-unused cold frame for the project. By the end of the season these herb gardeners had concocted many lovely and useful items including dill and garlic vinegars, dried sage and oregano, lavender sachets, and a recipe book filled with herb dishes members brought to the popular potluck suppers the group frequently share. It is maintained and seasonally enhanced by the Club. The "Herb Group" is still very active and would love to include new members. Lake Street Butterfly Garden: In 2005, members of the Civic Improvement Committee created a Junior Gardeners' Program for elementary school children at the Lake Street School. It was planned, planted and is maintained by the Club and third grader students. Northeast Gateway Garden: Located at the intersection of Route 30 and Grove Street at Lafayette Square this second gateway garden was planted in 2006 in partnership with the Garden Barn. 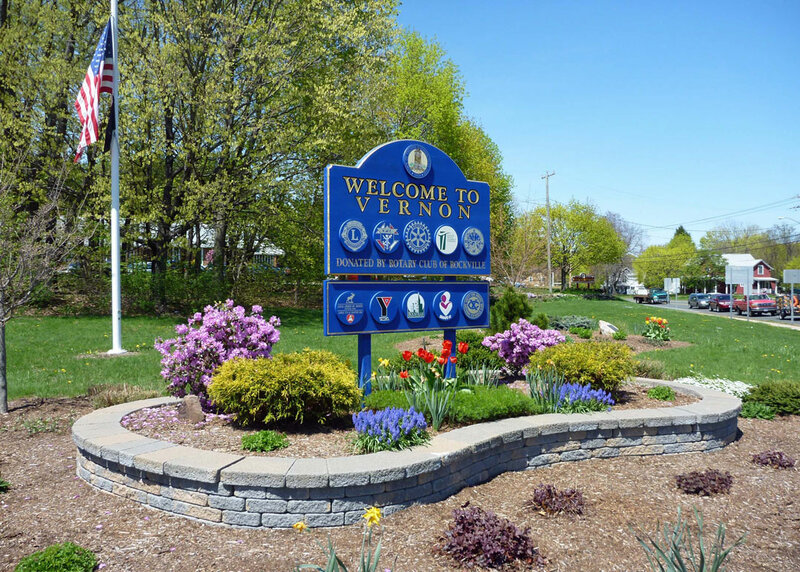 This garden welcomes visitors to Rockville entering from I-84 Exit 67. The club provides on-going maintenance for this garden. The plants are also mostly drought tolerant perennials. Belding Wildlife Butterfly Garden: The Club assisted JANE SEYMOUR in creating this garden near Bamforth Road in the Belding Wildlife Management Area. In the spring of 2001 and 2003, the club sponsored a two-day bus trip to the Philadelphia Flower Show, open to and enjoyed by both club members and others in the community. In 2004, the club sponsored a three-day trip to view the gardens of the Brandywine Valley. Other daytrips have included the Brooklyn Botanical Garden, "Blithwold," Roger Williams Botanical Center, and the Newport Flower Show. This year on June 28, they visited "Stonecrop Gardens," the original home of garden conservancy founders Frank and Anne Cabot, in Cold Spring, NY. Various day trips to member's gardens and other related points of interest continue to be popular events for members and guests. Every two years the club organizes a tour of some of the best private gardens in Vernon. It's an opportunity to peek behind the fences and into the backyards of some of Vernon's best gardeners. Tours have been held in 2005, 2007, 2009 and 2011. » See a slideshow of the 2011 'Garden Reflections' tour. * Workshops and field trips. Members of the VGC continue to exhibit at Hartford's Wadsworth Atheneum's "Fine Art and Flowers Show" each May, and participate in the "Connecticut Flower and Garden Show" held at the Connecticut Convention Center each year in February. * The VGC awards an annual $500 scholarship to a graduating senior at a local high school who will be pursuing a career in horticulture or a related field. In 2003 the mayor, club members and others from the community gathered to officially dedicate the Garden on the Green and to celebrate the installation of an eye-catching new sign. In Fall 2003, the Vernon Town Council recognized the VGCs work in establishing this garden by awarding them a Certificate of Merit. In 2003 the Connecticut Federation's Fall 2003 Awards Luncheon the VGC was presented the Lucille Schavoir Bowl in recognition of the outstanding work done in constructing the Garden on the Green. At the Federation's New England Regional meeting, the club was presented with The Sue Saul Award for creation of the Herb Garden. In 2007 they received three major garden awards: the Sears Civic Beautification Award presented by The National Garden Clubs, New England Region, the Luckner Youth Award for the Junior Gardener Program, and the Achievement Award for Civic Development presented by the Federated Garden Clubs of Connecticut. In 2008, GINNY GINGRAS, our first president, received the Tribute Award for All-Around Excellence from Federated Garden Clubs of Connecticut. In 2010, we received citations from the Federated Garden Clubs of Connecticut for ongoing work with the 'Jr' Gardeners, and our beautiful 'Public' gardens. The Vernon Garden Club welcomes new members. For information contact the club at vernongardenclub@sbcglobal.net.